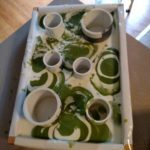 I decided to try the July Soap Challenge sponsored by Amy Warden at Great Cakes Soapworks . 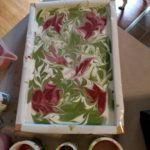 I had tried the May Soap Challenge which was to make a beautiful tear drop swirl in the middle of the soap bar. I tried three times to make a tear drop and ended up with a mountain one time and a space ship the next. 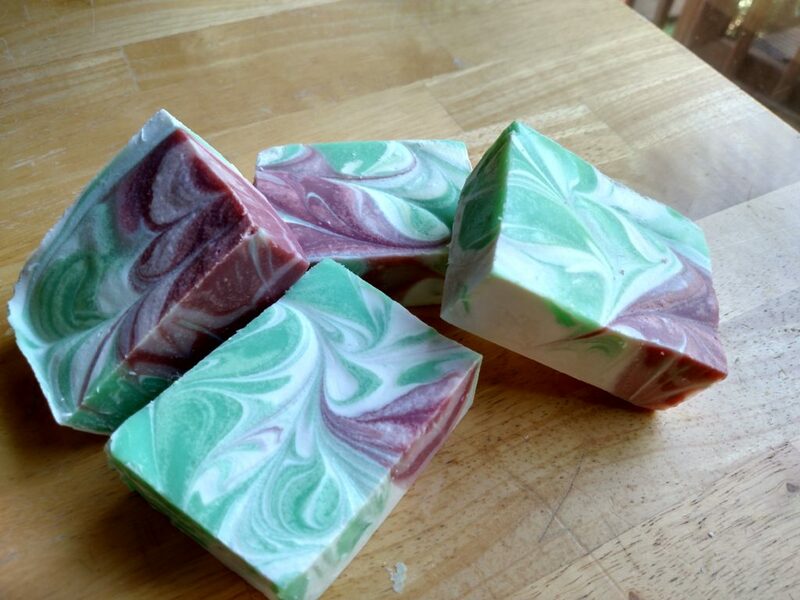 It was fun trying and the fragrance I used smelled awesome ~ Bramble Berry’s Juniper Sage. 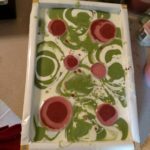 So I have some interesting soaps to use and sell so all is good. I was determined that for this challenge I would be successful. 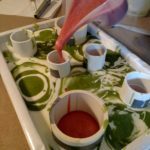 I studied the videos in the tutorial that Amy provided plus the ones that the original soapmaker had done. 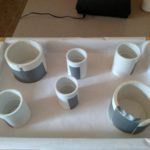 I went out and purchased my PVC couplings and planned out how I would be place in the mold. I was also determined to play and have as much fun as possible. I was a bit nervous and trying to work quickly to get all poured into their appropriate areas. This was a bit of a race but I got it all done. I was so doing the happy soap dance afterwards ! I was so glad that I tried this challenge that at first seemed not possible to accomplish after what happened the last time. I was glad able to push through my uncertainty and also to just have fun with it! Pushing the envelope outside your comfort zone can be a bit scary but so rewarding once you do it and it makes it easier to keep trying the next time. What challenges or opportunities to push yourself have you tried lately? After the Show is Over! Push that envelope…what the heck, push, shove and beat that envelope into submission! Your watermelon soap looks AMAZING!!! Yep, dogs are the BEST photo bombers! I agree it’s good to push out of your comfort zone. A few months ago I started doing skin care classes with elementary students. I was nervous and concerned I would have a problem keeping their attention. I prepped for that first class and didn’t sleep well the night before. I worried for nothing, they loved the class, and so did I. While we make a product for our skin, we talk about how to be beautiful on the inside. I’m adapting the class for middle school girls now, and getting ready to see if I can drum up interest in other places like local libraries. Angela that is so awesome and so happy for your success! Cool beans! I love it! Part of the fun of Amy’s challenges are to step outside your comfort level and try something new. I love participating when I’m able. I can’t wait to see this soap cut. The soap looks beautiful. Here’s to pushing the envelope! thanks so much! 🙂 it was allot of fun! You did a great job!!!! The push showed a great reward. Love the color choice and theme you chose. This came out really gorgeous! I bet the watermelon fragrance smells awesome! This was my first challenge and it took me a few tries to get it right, but it was a lot of fun and I look forward to next month’s challenge. 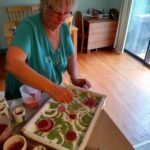 I love the watermelon theme – and the way you’ve swirled them really came out nicely. Congrats! Thanks so much Amy and for all you do with the challenges! Your soap turned our really well. I second your opinion of granddaughters! They are awesome.